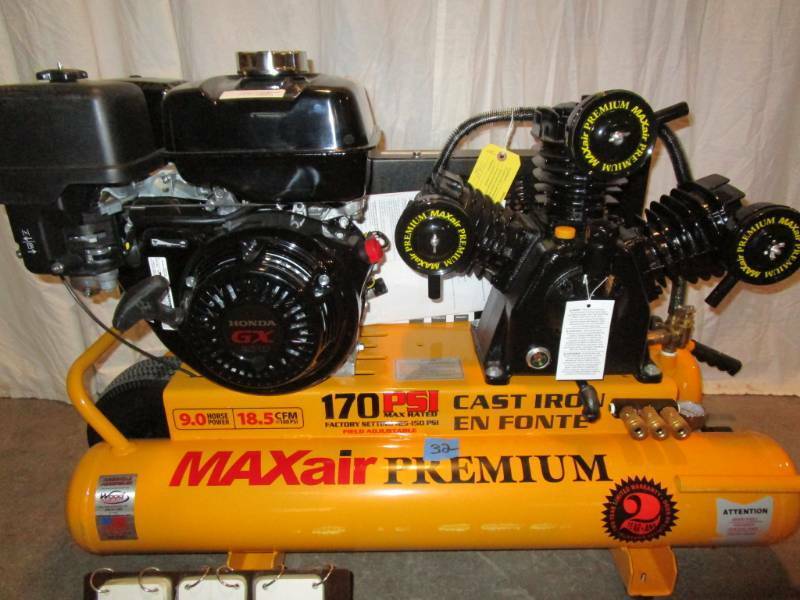 Max Air Premium 10 gallon twin tank job site air compressor, 170 psi, 18.5 cfm, Honda GX270 gas motor, model #TT90G-Map. American owned and assembled. 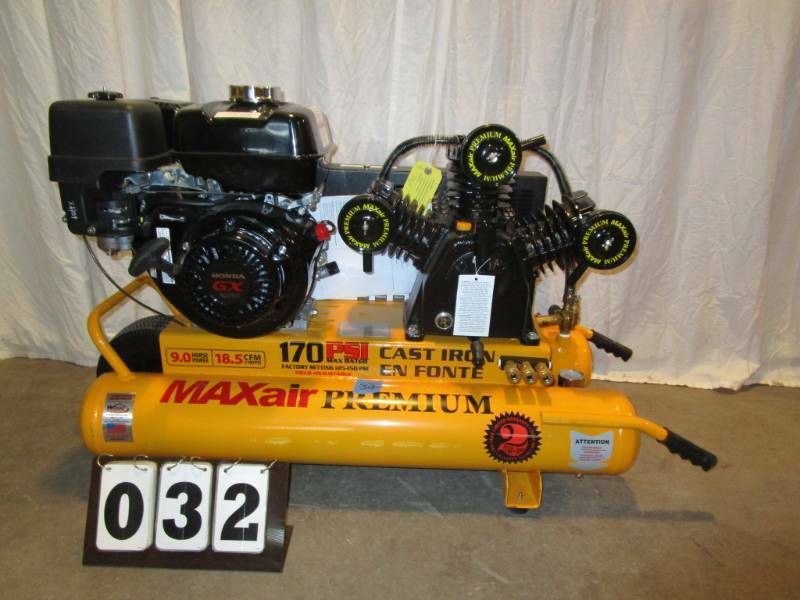 Great selection of new air compressors, air tools & accessories, generators & inverters, pressure washers, winches & winch accessories, concrete saw, tile saws, Port-A-Cool and more! These are new items. Samples displayed at National Tradeshows. We can't stress this enough that these are new items, "not" returns! No Reserves. Inspection: Wednesday, April 10, 2019 from 1pm to 5pm. Auction ends: Thursday, April 11, 2019 starting at 7 pm. Pick up/removal: Saturday April13, 2019 from 10am to 2pm. Pick up/removal date and time is not flexible,. If you can't pick up items during the schedule time, please do not bid. Assistance with loading is not available. Please bring the necessary manpower, vehicle, and equipment you need to load your item. Items are at standard dock height. There is a ramp that goes from dock height to ground level that some items may be rolled down. 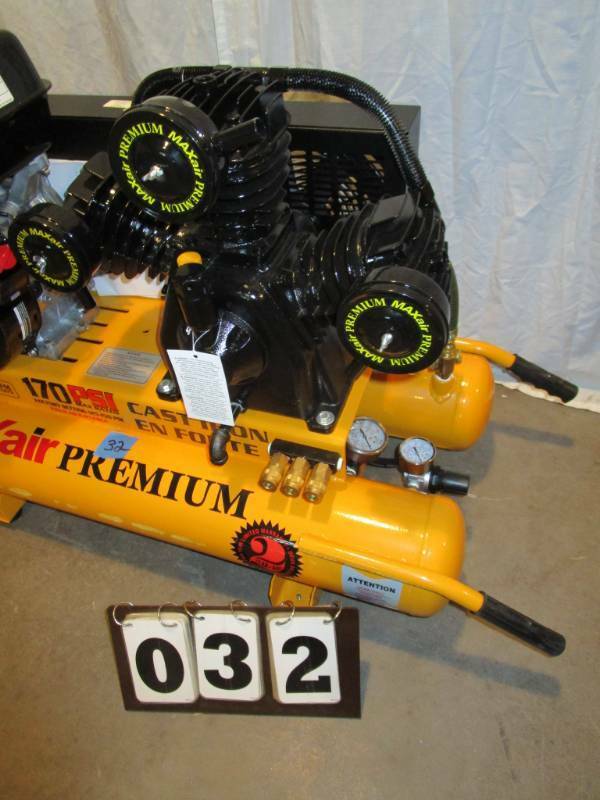 Large air compressors "should not" be rolled down the ramp. Shipping can be arranged for smaller items only. See details under the shipping tab. We accept cash, Visa, Mastercard, Discover, American Express. No checks of any kind. This auction is contracted and managed by Town Country Sales. Phone 651-600-4497. Applicable Sales Tax will be collected. Affiliate accepts Visa, MasterCard, Discover, American Express, and Cash. NO CHECKS. Payments will not be accepted after designated pick up time. Pick up date and time is not flexible. If you are unable to have the item picked up during the scheduled removal date and time, please do not bid. If you choose to pay in advance of the scheduled pick up/removal time and fail to have the item picked up during the scheduled time, you forfeit both the monies paid and the item. Assistance with loading is not available. Bring the necessary equipment, vehicle, and manpower needed to load the item. Everything is sold "as is, where is" with no guarantees or warranties unless noted. You are responsible for inspecting items prior to purchase. All sales final. No Refunds. At the close of the auction active items will remain open until no bids have been received for three minutes. By placing a bid on this auction, you are agreeing to the auction specific terms listed in addition to K-bid user terms. Important Note: If the high bidder of an item does NOT acknowledge the purchase, K-Bid and the affiliate reserves the right to determine how and to whom it will be resold. If we determine the winning bid was not bona-fide bidder, the item WILL NOT AUTOMATICALLY go to the next second-highest bidder. Shipping for smaller items "only" can be arranged for a handling fee of $10.00 per package and actual shipping charges. Shipping must be arranged and paid in advance directly with Town County Sales, and not after the pick up date and time. Please call for details.